When you move out on your own, away from your family, you often buy the same products they do, because you're used to them and know what to expect. For example, I always bought Ragu because that's just what we always had for pasta sauce, except maybe the occasional Prego. But as time goes on, you try new things, and through trial and error, come up with your own favorites. So here are some cooking and food related products I'd endorse if I was famous. I'm picky about frozen dinners. The chicken tends to be gamey and chewy, the meals small and not very filling or really salty tasting, and generally not worth the price. But I've FINALLY found frozen meals worth telling people about, and I'm even eating one right now. 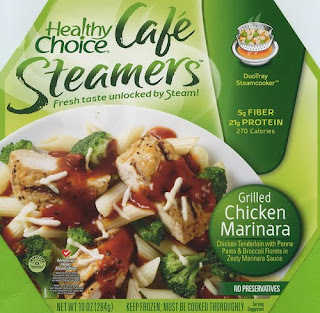 They're the Healthy Choice Cafe Steamers. The meat (which isn't gross or gamey or over processed like many frozen meals) and many fresh-but-frozen veggies are in a steamable bowl that sits over another bowl of sauce. They cook for about 4:30 and come out perfect- you just pour the upper bowl's contents into the sauce and you have a really good meal. The prices for these run all over the place, but I've been able to get them for 3 for $9 and 4 for $10. They come in a wide range of options. My favorites are the 5 -Spice Beef and Vegetables and Chicken Pesto Classico. True Lemon is real, crystallized lemon in a little itty bitty packet. 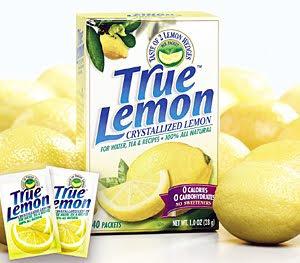 Each packet represents 1 lemon wedge and can be used like you'd use any lemon- in recipes, in your water... They taste like real lemon and not a bunch of sugar, because, well, they ARE real lemon. (Funny thing- there was a severe lemon shortage, last year I believe, which meant even True Lemon wasn't on the shelves at the grocery store.) They can be found in the iced tea section at the grocery store with the other water-flavoring packets. These small cardboard containers hold the best juice I've had from off of a grocery store shelf. Sure, they're marketed as a kid's drink, but who cares? They come in two flavors- berry and apple- and have no added sugars. They contain added nutrients to help with your immune system. Note to parents: Juicy Juice also has a Brain Development version of these same flavors, but I always get the Immunity ones to help prevent colds, etc. They're a little expensive (on sale 2 for $5) but to me, worth every penny. I don't like juice normally because it's way too sugary, but these are perfect. I'll add more "endorsements" like these as I go along. Please post comments telling me food products and brands you swear by.